You may have heard the term "slipped disc" used to describe a low back injury. Discs do not actually "slip". Rather, they may herniate or bulge out from between the bones. A herniation is a displaced fragment of the center part or nucleus of the disc that is pushed through a tear in the outer layer or annulus of the disc. Pain results when irritating substances are released from this tear and also if the fragment touches or compresses a nearby nerve. Disc herniation has some similarities to degenerative disc disease and discs that herniate are often in an early stage of degeneration. 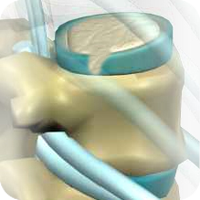 Herniated discs are common in the low back or lumbar spine.